Open-air theatre with a permanent stage that resembles a showboat. Opened 1935. Used as a community stage for free amateur entertainment shows over the summer months. Reverse Text: "Vancouver, B. C., Canada. 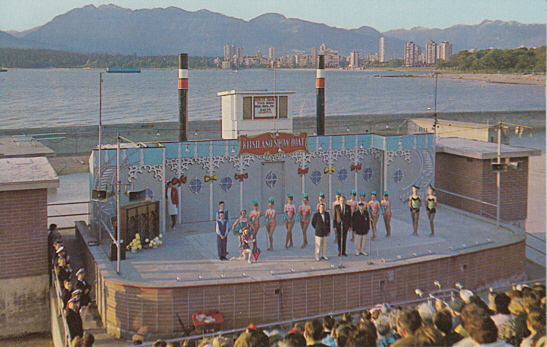 The Kitsilano Showboat has to date completed over 30 years of beach entertainment, sponsored by the Kitsilano Chamber of Commerce. Over a quarter million people attend this amateur show and over 2,500 entertainers volunteer their services each season. From early June to late August, this great little show goes on nearly every evening from 8 p.m. to 10 p.m., midst beatuiful surroundings."